^ "Nissin Foods – About Us". 2018-11-22. Archived from the original on 24 October 2007. ^ a b c USDA (6 Nov 2010). "Commercial Item Description Soup, Noodle, Ramen, Instant" (PDF). USDA. Retrieved 16 Dec 2016. ^ "7 Fast Facts About Instant Ramen". Spoon University. 2015-04-02. Retrieved 2017-11-15. 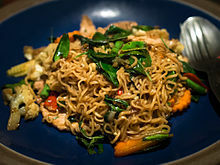 ^ a b Asian noodles : science, technology, and processing. Hou, Gary G. Hoboken, N.J. ISBN 9780470179222. OCLC 907642187. ^ a b Gulia, Neelam; Dhaka, Vandana; Khatkar, B. S. (2014-01-01). "Instant Noodles: Processing, Quality, and Nutritional Aspects". Critical Reviews in Food Science and Nutrition. 54 (10): 1386–1399. doi:10.1080/10408398.2011.638227. ISSN 1040-8398. PMID 24564594. ^ Belitz, H.-D.; Grosch, Werner; Schieberle, Peter (2009-01-15). Food Chemistry. Springer Science & Business Media. ISBN 9783540699330. 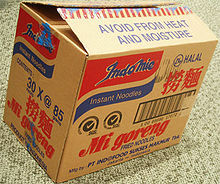 ^ "Indonesia Named 2nd Biggest Consumer of Instant Noodles". June 2, 2016. ^ Lo, York (2018-02-02). "Instant Noodles, Enduring Success: the story of Winner Food Products, maker of Doll noodles and frozen dim sum, Vecorn Oil and others". The Industrial History of Hong Kong Group. Retrieved 2018-04-02. ^ "Doll instant noodles". Do You Remember?. 2010-10-09. Retrieved 2 April 2018. ^ a b Annual Report 2014 (PDF). Thai President Foods. 2015. Retrieved 9 Jun 2015. ^ "Maggi is back, stores see rapid sale after relaunch". The Indian Express. 2015-11-10. Retrieved 2016-03-12. ^ "10 Best instant noodle brands in India". W Live News. 2017-04-20. Retrieved November 4, 2017. ^ "Brief History". SAMYANGFOODS Co., Ltd. Archived from the original on 2004-06-17. ^ "Brand History" (in Korean). SAMYANGFOODS Co., Ltd. Archived from the original on 2004-06-22. ^ Samyang Foods "Archived copy". Archived from the original on 2004-06-17. Retrieved 2015-09-21. CS1 maint: Archived copy as title (link). Retrieved 4 July 2008. ^ Park, Ju-yeon (2015-12-13). "invigorating Korean market of ramyeon". ^ 신미진. "오뚜기 `쇠고기미역국 라면`, 500만개 판매 돌파 - 매일경제". mk.co.kr (in Korean). Retrieved 2019-04-12. ^ a b c d Yee, Tan Hui (2016-02-02). 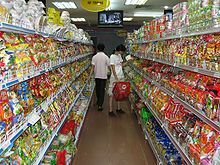 "Thailand's queen of instant noodles takes a hit due to slowing economy". Straits Times. Retrieved 2 February 2016.